Take the first step toward good health, know your risk factors. Wednesday, July 18, 2018 11:30 a.m.-1:00 p.m. The 2020 census is only two years away. The Census Bureau is dealing with budget cutbacks, lack of leadership, failed field tests, and more. These problems alone have the potential to seriously hurt the success of the census, but the introduction of the citizenship question to the document raises many problems that will have long lasting, negative effects. 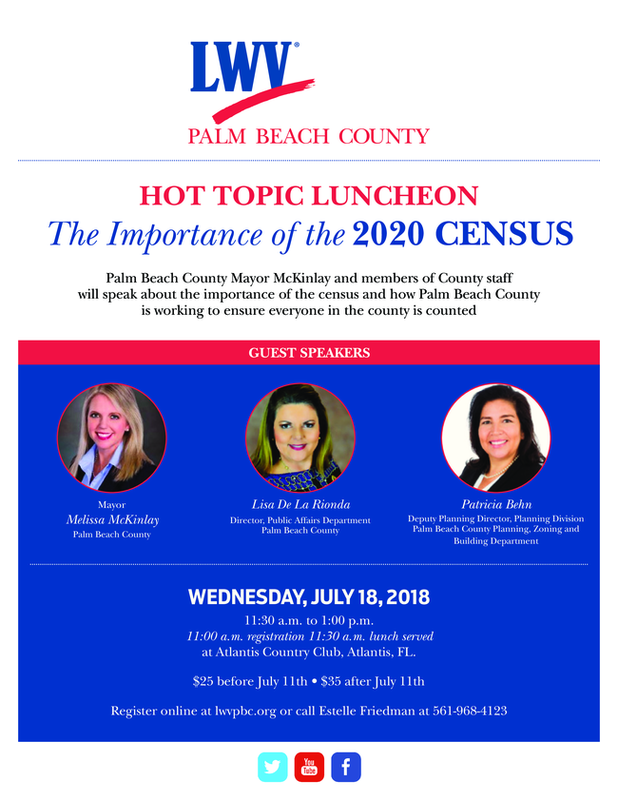 Palm Beach County Mayor McKinlay and members of the County Administration staff will be talking about the importance of the Census and how Palm Beach County is working to preserve the census at our Saving the Census Hot Topic lunch on Wednesday, July 18, 2018, 11:30 a.m. – 1 p.m. at the Atlantis Country Club. Doors open at 11:00 am. 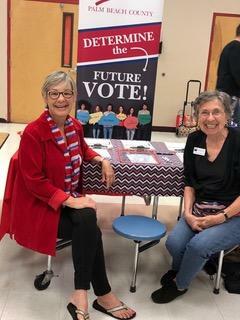 You can register at lwvpbc.org . WHEN: MONDAY, JULY 23, 2018 from 6:00 to 9:00 p.m. 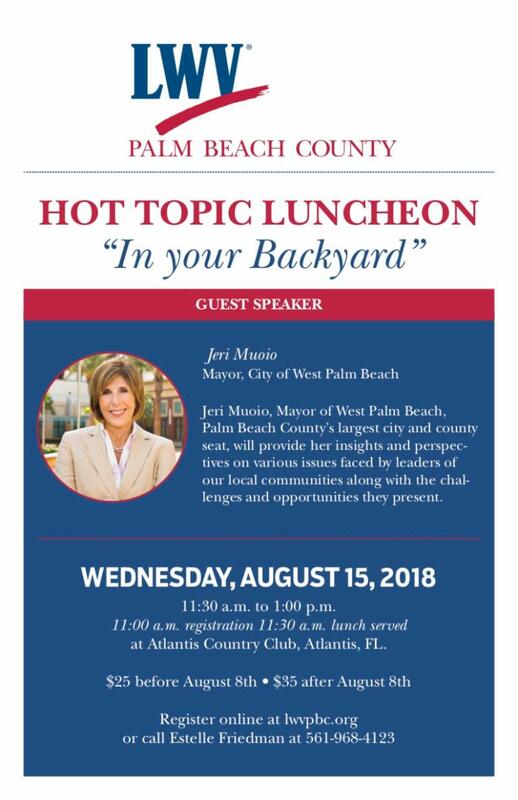 WHEN : WEDNESDAY, JULY 18, 2018 from 6:00 to 9:00 p.m.
Join LWVPBC for our August Hot Topic on Wednesday, August 15, 2018 from 11:30 a.m. to 1:00 p.m., with registration beginning at 11:00 a.m. As always, it will be at Atlantis Country Club in Atlantis, Florida. topics including affordable housing, homelessness, climate change, and the environment. click the "Calendar of Events" button below to go to our webpage! Over seawalls and up through storm drains and even into wells needed to keep faucets flowing, the sea is invading South Florida. Sea level rise isn’t just a flood threat. The invading sea is also seeping underground and coming for your drinking water. Decades of too much pumping and draining to provide both drinking water and flood control leave South Florida susceptible to “saltwater intrusion” - that’s when the ocean moves in and contaminates underground freshwater sources. Trends & Solutions was Superb. 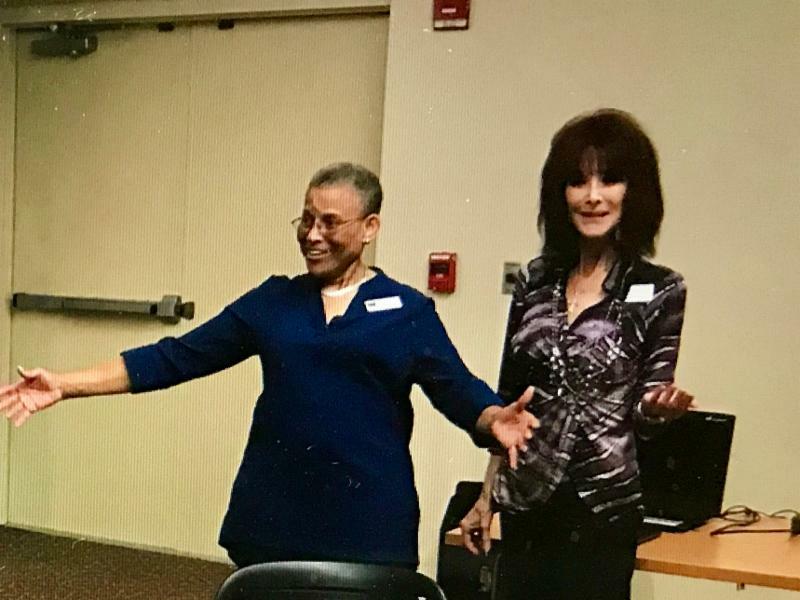 Dr. Tom Gabor, criminologist, sociologist, author and one of our own PBC Leaguers, offered a thought-provoking presentation at our Cool Topic meeting in June. He provided unique insights into "the" issue of the upcoming midterm elections. As Tom wrote in his recent article, It's the Guns, Stupid!, he characterized Florida as the laboratory for pro-gun laws. He stressed the importance of being educated on this topic. 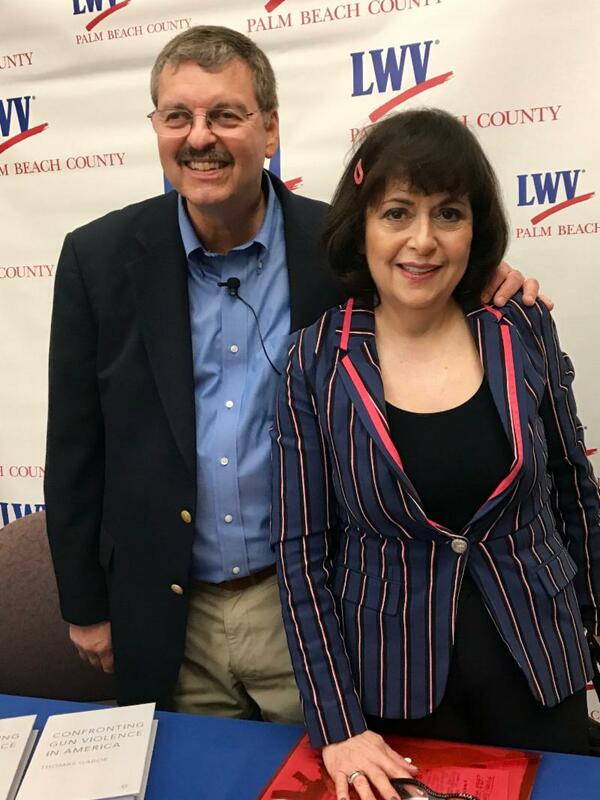 He asserted that it is up to Floridians to address and adopt the appropriate solutions and referred to his book, Confronting Gun Violence in America . 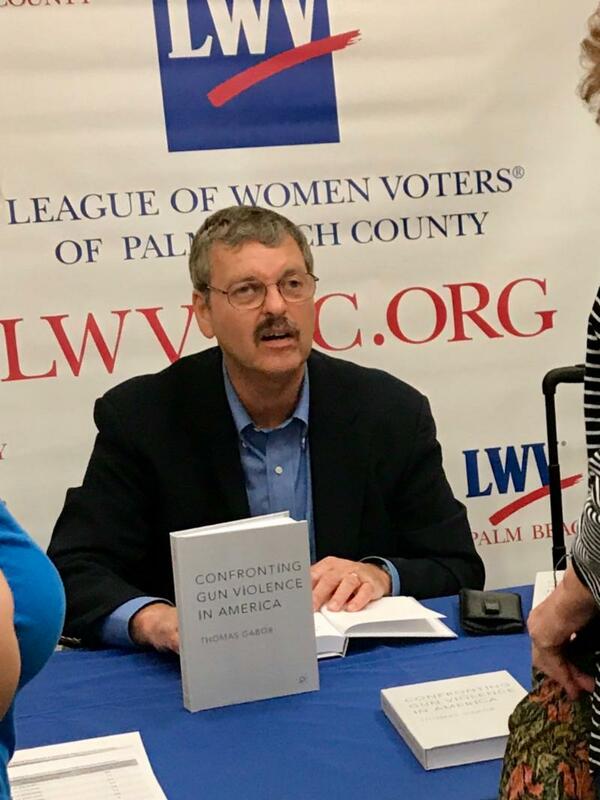 For members not fortunate enough to hear Tom at the recent Cool Topic, don’t miss the video now available on the League’s website, lwvpbc.org , or by clicking the button below. 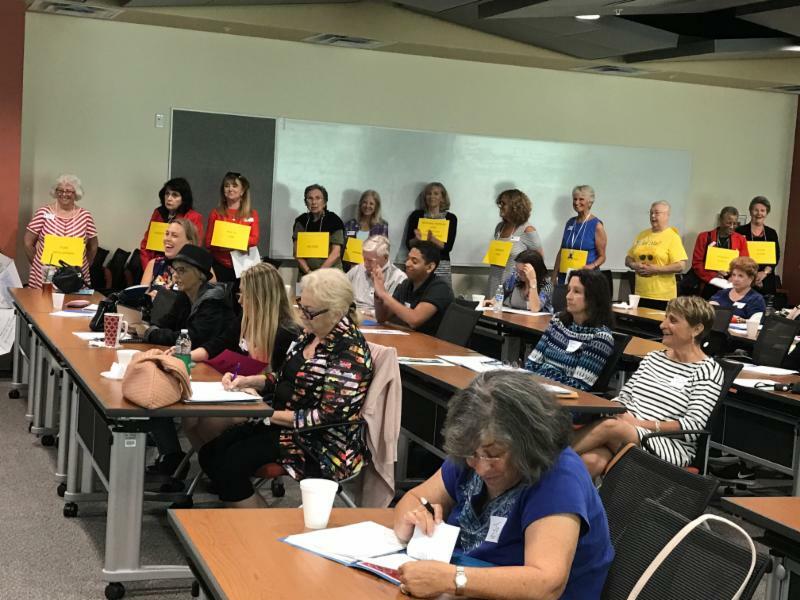 The Speakers Bureau is busily gearing up its training for the Constitutional Amendments and other issues which will be on the November ballot. The next session is scheduled for Saturday, August 25, 2018 from 9:30 a.m. to 2:00 p.m. at the STEM Center. The League has many presentations available. To schedule any of them, please contact Ethelene Jones at ethelenejones@gmail.com . You must have League training before speaking to outside groups on behalf of the League. We are looking for more presenters, especially for the amendments. If public speaking is not your forte, we also need members to assist the speakers by collecting questions and helping out with other tasks. Pictured above right are Ethelene Jones and Lorna O'Connell at the last training session. Another Intern has Joined LWVPCB! 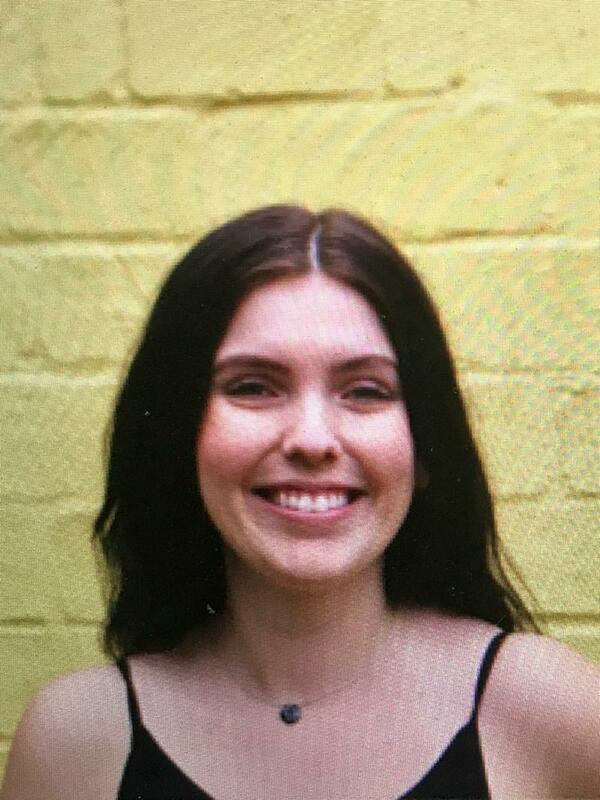 2018 Summer Intern Greta Schultz is a student at the University of Florida. She will be starting her third year at UF in the Fall. Greta is studying for a double major in International Studies with focus on the Middle East and Political Science as well as minoring in TESL ( Teaching English as a Second Language ) and Arabic Language. 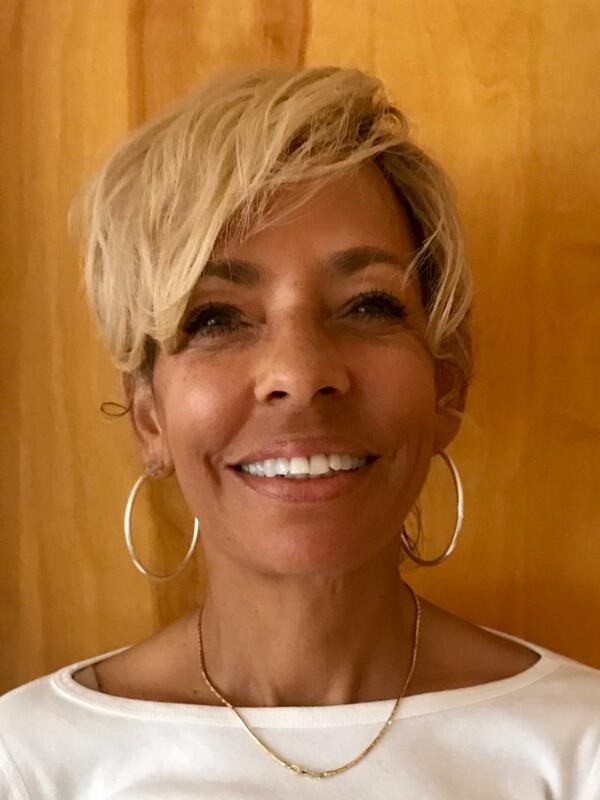 She is volunteering with the League because of her interest in local political advocacy and civic engagement. She believes that the League will help her gain event organization and execution skills as well as experience in training. ﻿We are delighted to welcome Greta to our intern team and feel certain that her research and technical skills as well as her unique perspective will be assets to the League. Pictured above is Orientation, May 2018. For contact information, go to the member directory at lwvpbc.org . The June meeting of the Board of Directors was held on June 11, 2018. The following is a summary of Board actions. Christene Campbell-Gabor, Rebecca Cohen, Ken Horkavy, Keeter Martinson, and Ken Thomas were appointed as Directors for one year terms. We are nearing the completion of updating to our new Club Express data management system. 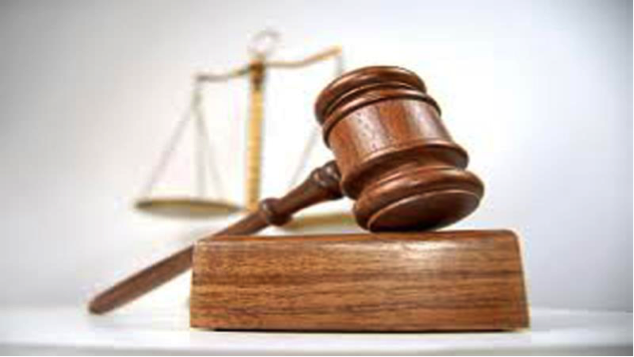 Several proposed bylaw changes were discussed and approved. The August 1 edition of NEWS will include the proposed changes which will be voted on at the September 8, 2018 Cool Topic meeting. RSVP IS REQUIRED to Pam at 9305)873-4239 or maldonadopbc@gmail.com . 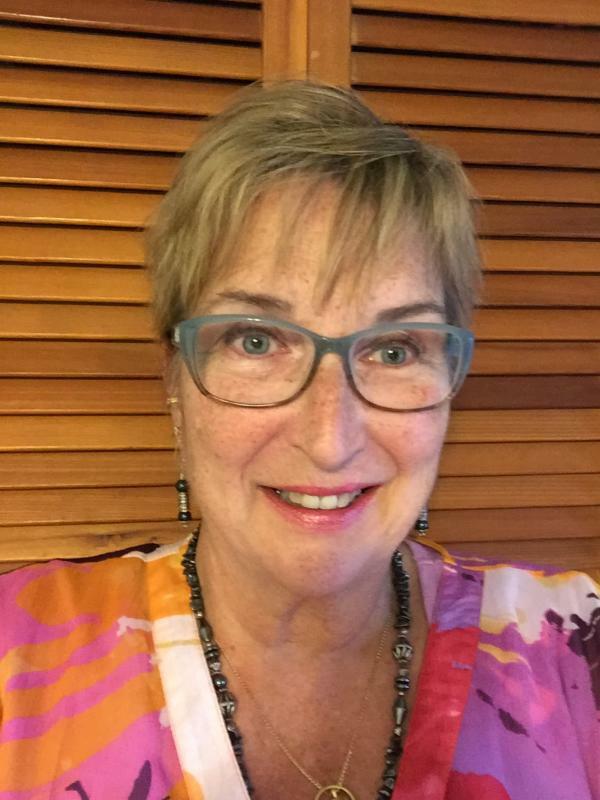 I want to introduce you to Emilie McKendall, our Co-Editor. She is eagerly learning the system and will be editing one issue per month. We will be available to cover for one another as well. Emilie is fairly new to the League, but comes to us by way of Chicago where she had her own syndicated show. She is a naturally gifted communicator and we are very lucky to have her. We are still struggling with the new webpage format. We will transition to the new system as soon as we can. We still need your assistance for Voter Guide distribution. Please help your league by agreeing to take the Guides to locations near you, like libraries, government offices, and other heavily trafficked places. Contact Joyce Sullivan at jtfsullivan@comcast.net to help.